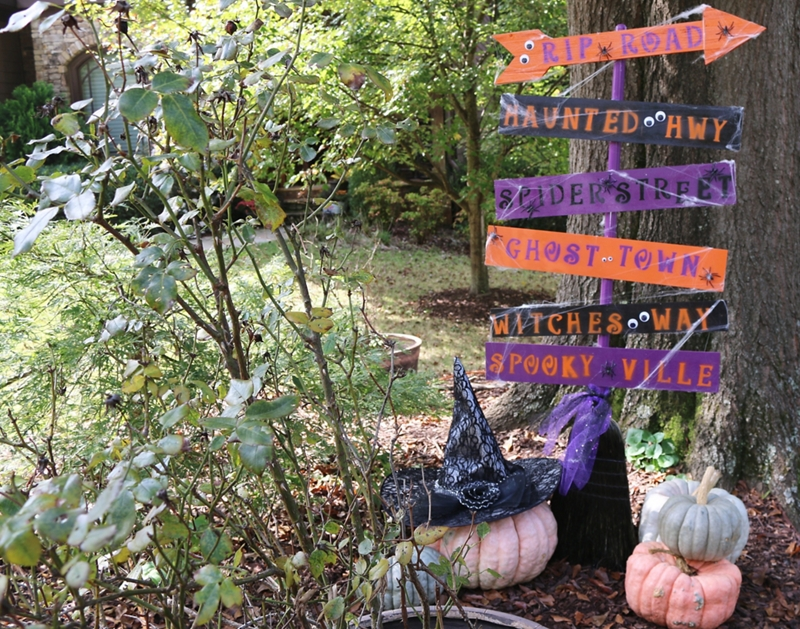 Add spooky spirit to your front yard for Halloween with Krylon® ColorMaster® Paint + Primer gloss colors! In a well-ventilated area, cover a flat surface with a drop cloth or tarp. Lay the broom flat on the tarp. Use painter’s tape and a plastic bag to cover the bristles so that you can spray paint the handle. Before spray painting, read and follow safety and application instructions on the can. Use Krylon® ColorMaster Paint + Primer in Gloss Rich Plum to paint the broom handle. Once dry, flip the broom over and spray the back of the handle. Remove the painter’s tape and bag when the handle is dry to touch. Once the broom handle is fully dry, tape the entire handle, and then spray bristles with a light coat of Krylon® ColorMaster Paint + Primer in Gloss Black to add an extra spooky look. Once the bristles are try to touch, remove the tape. Lay the planks in three groups, one for each color. Make sure they are far enough apart to avoid overspray. Spray each group with a different color, using Krylon® ColorMaster Paint + Primer in Gloss Rich Plum, Gloss Pumpkin Orange, and Gloss Black. Allow the first side to dry before painting the other side. Lay the yard stake on the tarp and spray with the Krylon® ColorMaster Paint + Primer in Gloss Rich Plum. Allow the first side to dry to before painting the other side. Once the planks are dry, position the stencils on the plank to create scary places. Cover the remaining spaces with painter’s tape to avoid overspray. In the Krylon color of your choice, start spraying a few inches off the plank and use smooth sweeping motions to spray directly above the stencil. Carefully remove stencils after you are done spraying. Do not let the stencil dry on the plank. Remove the tape once the paint is dry to touch. Once all pieces of the project are dry, position the planks how you would like them to appear on the broom handle. Attach with wood glue or super glue. Allow the project to dry according to glue package. Add spooky decorations to the planks like googley eyes, fake spiders and webs, or skeletons. When you are ready to display, drive the yard stake into the ground with a hammer. Attach the broom to the yard stake using zip ties. If you need a little extra support, use a brick or rock for support behind the yard stake. Add tulle around the base of the broom handle to cover the zip ties.